Put some water in the Instant Pot and add the little trivet. You ought to be able to poach eggs in some container above the trivet. Right? Right. We went through a dozen or more eggs, eggs-perimenting with this, and tell you that the answer, like all social science is “It depends,” because there are a lot of variables. Our first trial was to put an egg into each of two little glass ramekins that we had sprayed with cooking spray, and set them on the trivet over 1 cup of water. We closed the pot and the steam vent and pressed the Manual button for 3 minutes. Since it take the pot almost 6 minutes to heat up the water and come to pressure, this actually takes 9 minutes to cook the 2 eggs. We released the pressure quickly (30 seconds) and lifted out the two ramekins on the trivet. It took a bit of time to unmold the eggs: we ran a thin spatula knife around the edge of each dish to loosen them. And even this wasn’t that quick, because the ramekins were so hot that we had to wait a bit before we could handle them. And unmolding the eggs is delicate enough that using hot pads or gloves just won’t cut it. But we did get the eggs out and onto toast in about 11.5 minutes. They looked fairly nice, although weird because they are actually upside down: the yolk, which would normally by on top is inverted and is now on the bottom. However, when we cut the eggs open, they were a bit overdone. The yolk was more cooked than we would like for a classic poached egg. Moreover, the whites were distinctly tough and rubbery. Rubbery whites were something we saw in cooking hard-cooked eggs under pressure. It vanished if you cooked the eggs at low pressure. So we tried cooking the eggs at low pressure, reducing the time to 2 minutes. They weren’t sufficiently cooked, so we repeated the experiment at 3 minutes and low pressure. These were actually pretty nice, but again, it was hard to unmold them, and the ramekins were just as hot, so it took some time. Again, the elapsed time was at least 11.5 minutes or more, and while the eggs were cooked well, it was hard not to break them while unmolding them. Some people have recommended poaching eggs in little silicone cups. We picked up a couple of Poach Pod cups at our local Cook’s Nook. Some people have also tried other similar egg poacher cups like these from Zenda Home. We sprayed them with cooking spray as they recommended and cooked 2 eggs for 3 minutes at low pressure. They weren’t done, so we returned them to the pot for one more minute. These were done and looked pretty nice in their silicone cups. But, while the pods weren’t as hot as the glass ramekins, they were very difficult to get the eggs out of. In fact, even though we carefully ran the spatula knife around them, one of them broke. Further, they were hard to center over the toast. While the eggs were cooked properly, getting them out was far too difficult, and we don’t recommend them. This took nearly 12 minutes. Finally, for comparison, we poached two eggs in a saucepan as we have described before. It takes 3 minutes to bring a quart of water to a boil in a 2 quart saucepan, then we turn the heat down so the water is barely bubbling, swirl it with wire whisk and crack the eggs one at a time into the swirls. The eggs are done in 2-3 minutes. The total time was 6 minutes, including lifting the eggs out onto the toast. And there are many fewer dirty dishes! So, we conclude that while it is certainly possible to poach eggs in the Instant Pot, it takes twice as long as in a saucepan, and since the cooking time is so brief, you have to watch the pot timer like a hawk so they don’t overcook. This takes away the “set it and forget it” advantages of the Instant Pot that you get for longer cooking stews or rice. We first visited “The Island Kitchen” when it opened in 2013. Chef Patrick Ridge and his hard working staff have turned this into a marvelous and wildly popular breakfast place, as well as serving lunch and dinner. Sundays, when we visited are limited to brunch service, ending at 2 pm, but they serve breakfast daily 7 am – 2 pm, lunch from 11 am to 2 pm and dinner from 5:30 pm to 9 pm. The menu is organized around some creative turns on the standard breakfast fare, the lunch menu includes “fried clucker,” which is a fried chicken breast sandwich with Franks Red Hot sauce and blue cheese dressing. The dinner menu has the convention steak and burgers, but has the very interesting Grilled Asparagus and Brie sandwich. But we want to rave about the breakfasts! A recent newspaper survey rated the Island Kitchen as having Nantucket’s best breakfasts, and we can see why, just from two orders. Our asparagus, mushroom and cheese omelet ($12.50) was outstanding, with the eggs properly cooked but in no way tough or dry. And the asparagus had just the right amount of crunch. 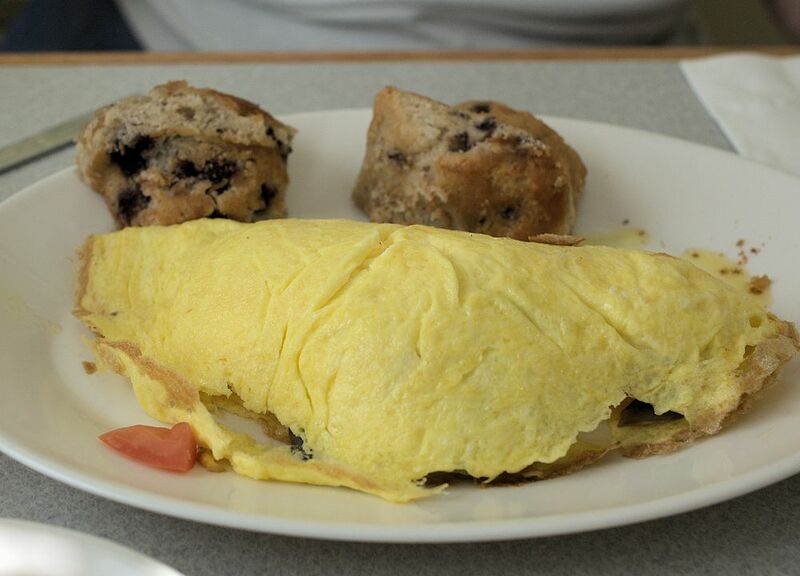 We rarely get an omelet that good anywhere. And finally, their breakfast special called “Animal” ($14.50) was a culinary tour de force. It was “two panko crusted eggs, sausage, bacon and hollandaise on a brioche bun.” In fact, it looked like the cooked poached egg was rolled in the panko breadcrumbs and then quickly deep fried to hold the crust on the eggs, which were still perfectly cooked. While filling, this is an amazing breakfast offering if you are that hungry. The Island Kitchen is at 1 Chin’s way, essentially across Pleasant Street from Stop and Shop, and somewhat recessed. There is ample parking and you are sure to have a great meal. They serve both indoors and outdoors in warm weather, and while they are likely to be busy, they are very accommodating. Currently, they are reworking the roof over the outdoor dining and the sign is missing. Just follow the crowd. Taco Bell announced this week that by the end of next year, they will be serving only cage free eggs in their breakfast menu items. This sounds like an excuse to raise prices, since cage free eggs command a premium price. Both McDonalds and Burger King have announced longer term plans to achieve this same goal. As we will see, this is basically a marketing decision. While many people believe that cage free housing results in better animal welfare, actual scientific studies show this isn’t true. As we described earlier, there has been some significant research on this topic, by researchers from UC Davis, Michigan State, Iowa State and the USDA. They set up 3 housing trials: conventional cages (CC), expanded cages (EC) and cage free aviaries (AV), and carried out 3 parallel studies using one flock divided into 3 parts. They then repeated the entire experiment the next year with a new flock. The experiments and data collection took about 3 years, and resulted in eight papers in the journal Poultry Science. You can read the summary of the results here. In general, the conventionally caged birds did the best in the experiment and the cage free aviaries the worst. The aviary birds cost about $1.85 more per pullet, and showed 5% lower productivity. The aviary hens had higher mortality (13.3%) compared to 4.8% in the conventional caged system. Aviary productivity fell to 10% below the conventional cages by the end of the cycle. On the other hand, the hens in the aviary were found to have stronger bones and thus less broken bones than the CC and EC hens, and showed more hen-like behaviors. AV and EC hens cost a great deal more than CC hens did, AV was worse for worker health and safety, and AV was worse for emissions, and EC the best for ammonia emissions. So, it depends on what measurements are important to you, but the higher mortality of AV hens and lower worker health and safety are certainly negative indicators. You can find an interactive chart of the results here. Our conclusion is that for animal welfare, the conventional cage systems are actually better despite popular impressions to the contrary. We were going to illustrate this article with photos of the Taco Bell breakfast items, but there is no nearby Taco Bell (within 20 miles) that serves breakfast. However, the reviews of these items have not been very good. Every time we have breakfast at Fog Island, on South Water Street, we wonder why we’d go anywhere else. The food and service are terrific, as evidenced by the crowds it attracts. We went a little later after a morning hike and had the place almost to ourselves. 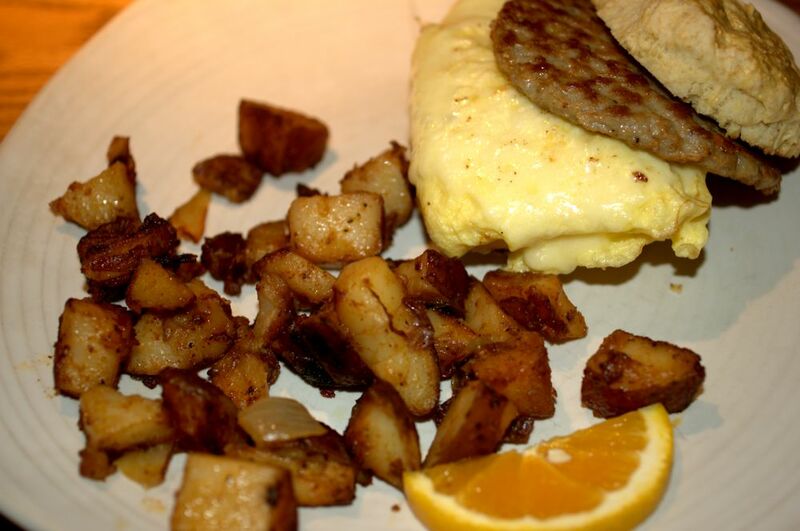 The breakfast menu features pancakes, French toast, breakfast sandwiches, omelets, fruits, cereal, basic egg dishes, and several styles of Eggs Benedict. We ordered their wildly popular Sausage Biscuit ($11.95) : scrambled eggs and sausage and cheddar cheese on a homemade buttermilk biscuit. It is so good it can bring tears to your eyes! 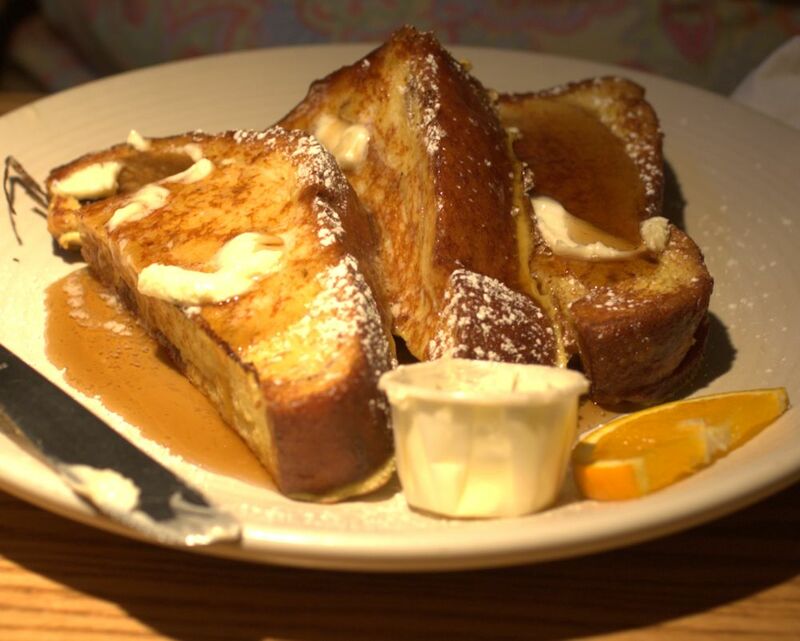 And, we ordered their classic French toast: thick cut cinnamon bread, dipped in cinnamon batter ($10.95). It was beautiful to behold as well as to eat. 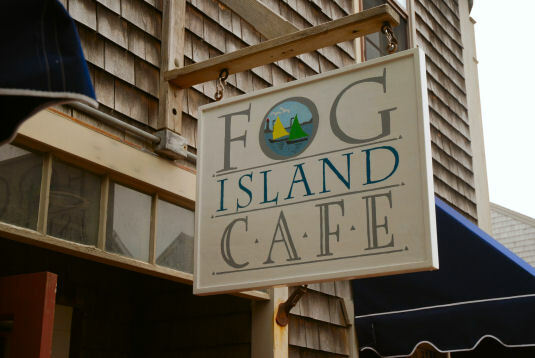 Fog Island Café serves breakfast and lunch and is open from 7:00 am to 2:00 pm (1:00 pm on Sundays). You are sure to be delighted. Incidentally, their website doesn’t display the menus correctly using Chrome, but it works fine using Firefox, but this does not take away from the excellent food. 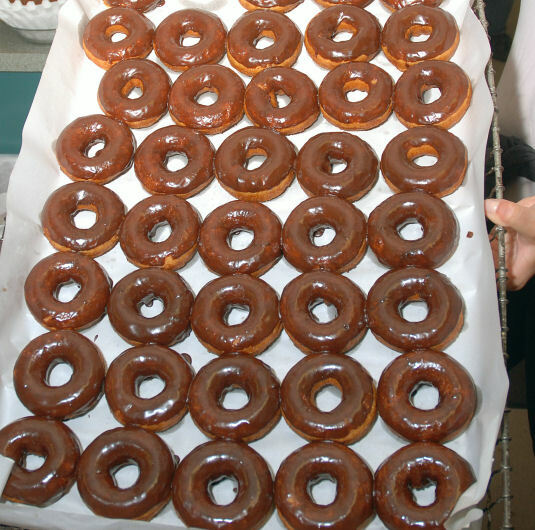 The Downyflake has been serving breakfast and lunch and making terrific doughnuts since 1935. It has been operated by one family after another since that time. Currently the owners are Ron Oldham and Patti Kennedy, who were previously the chef and manager of The Ropewalk. 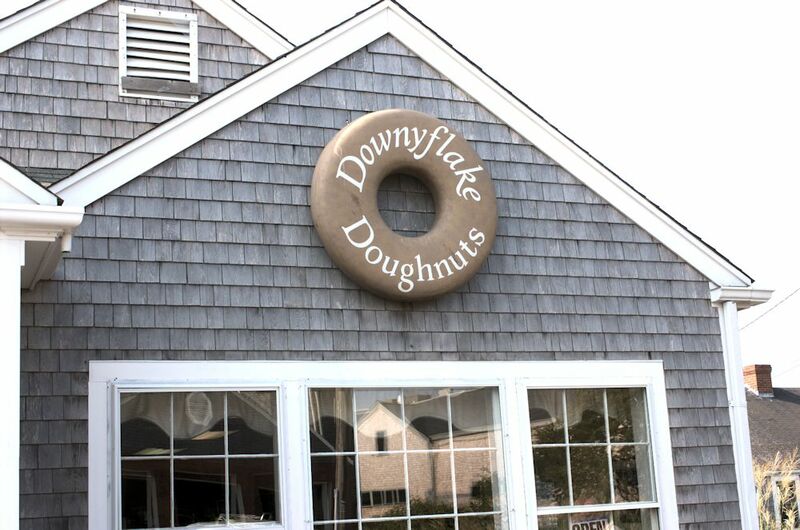 The Downyflake is the last of a chain of restaurants started by the Donut Corporation of America, and maintains the retro chain look of that chain. While it originally was downtown, the current building is at 18 Sparks Ave, across from the Fire Station, and just down the street from Stop and Shop. The Downyflake is noted for reasonable prices, and quick and friendly service, and is beloved by locals and tourists alike. We always try to get there a couple of times while we are on the island. The menu is simple but deliciously prepared breakfast and lunch fare along with their excellent donuts. 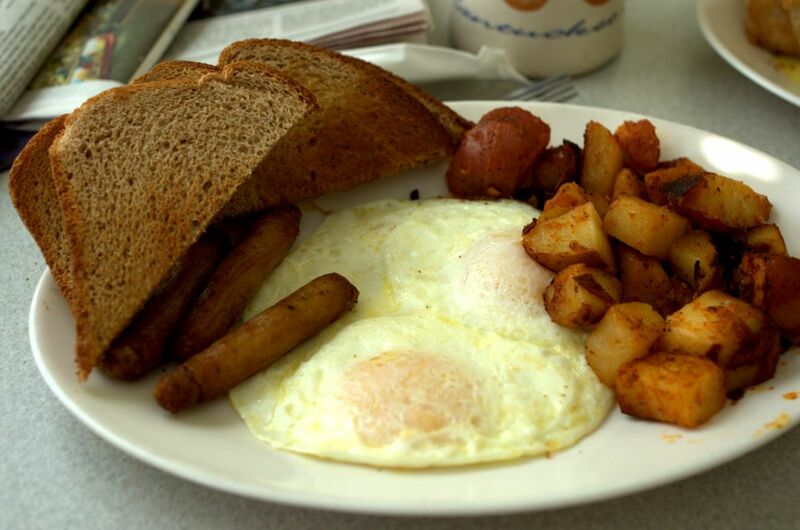 On this visit, we ordered the Flake Special (eggs, sausage, home fries and toast, $7.95), which was hot and perfectly prepared. 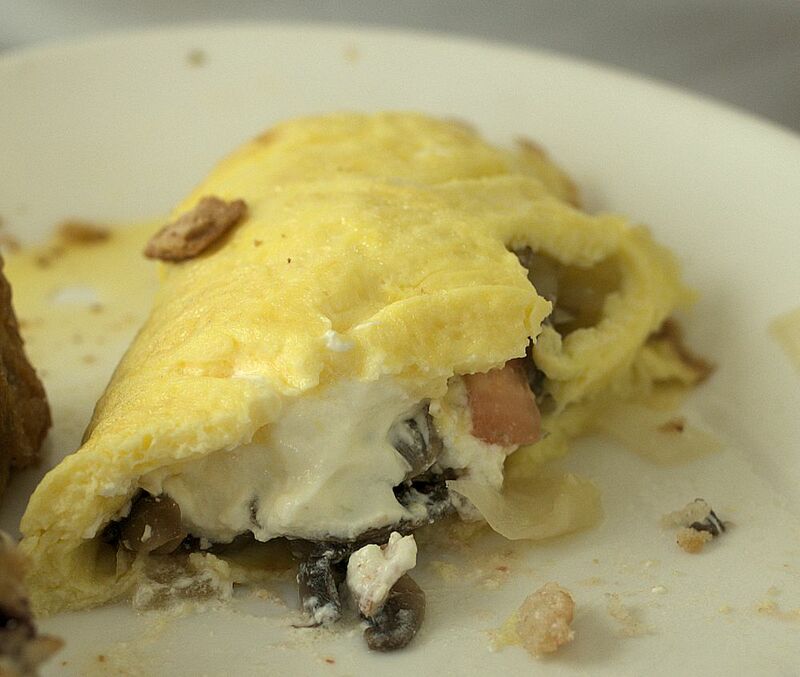 We also ordered the Downy omelet ($8.50), made from mushrooms, tomatoes, onions and sour cream. Again, absolutely perfect. Next time, we’ll go for the remarkable donuts! Don’t miss the Downyflake while you are on the island. Parking is tight, and we were not above walking down there after shopping at Stop and Shop! And do not forget that they don’t take credit cards. However, they do have an ATM machine.